We are excited to be offering a four-week 200 Hour yoga teacher training intensive this summer at Refresh. 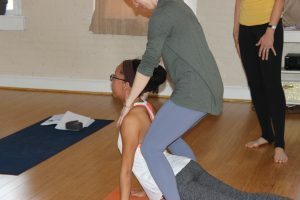 These yoga classes are the perfect opportunity for those who want to learn to teach yoga and are lucky enough to have summers off, have a flexible schedule, or who have vacation days to burn to earn their 200-hour yoga teacher training certificate. Some places of work may also count it as a professional development opportunity, so why not ask your boss if you can take the time off to learn this valuable skill? There are major advantages to an intensive yoga class program versus a weekend program approach. Both methods have their merits, and we are pleased to provide both options at Refresh Yoga Center. One of the obvious benefits to a 200 Hour Teacher Training intensive is that you finish quicker! I was able to complete my training in between semesters of graduate school and then I was a volunteer yoga teacher in the area for a while. I then found paid teaching positions in the fall. It was a fun way to supplement my income while I was in school. Universities always need more yoga instructors at their gyms and athletic centers! Why shouldn’t it be you? Committing to a one- month endeavor can be more conducive to one’s lifestyle than stretching out the training over many months and weekends. It opens up opportunities to work with yoga studios near you, whether you are in Alexandria or beyond. Another advantage is that you will be completely immersed in yoga for the whole month. You will be tired. It will be hard. But at the end of it, you will be a changed person. You will start learning in depth about yoga philosophy and what it means to live a yogic life. By the end of the first week, you’ll have studied over 18 hours of anatomy. Every day you will have an asana practice, and you will learn how to not only teach a practice but how to analyze the postures to make them safe for almost any person. In our program, we ask our trainees to complete a service project. This gets them out into the community and working as a team. You’ll make friends to last a lifetime and to support you throughout the journey. Along with yoga philosophy, anatomy, teaching methodology, techniques of practicing, and the service project, we will cover meditation and the use of Sanskrit. We provide a module on the Business of Yoga so that should you choose to make yoga classes a career or even just a part-time job in a yoga studio, you’ll have the tools and resources to make it happen. We’ll teach you the questions you need to ask in order to become a successful yoga teacher. Even if you do not want to teach yoga upon graduation, you’ll have left the door open to do so in the future. Your public speaking skills, your confidence, and physical health will all improve in just a short few weeks. Our 200 Hour Yoga Teacher Training intensive meets Monday through Friday from 7:30 AM to 4:30 PM for four weeks at Refresh Yoga Center on King Street in Old Town Alexandria just minutes from Washington, DC. This historic neighborhood provides a beautiful backdrop for your training experience. Our supportive teaching staff and yoga studio will guide you along the way. See you on the mat! Email us, info@refreshyogacenter.com, if you any questions or stop by anytime and take a yoga class with us!